Logging is in full swing and the dust is flying. It’s dry out there and the crews have their fire tools sharp and fire pumpers full. Craig winds his dozer down the skid trail. A skid of logs chattering toward the landing. A load of logs pulls out of the landing. I hope you don’t mind a little dust. Blitz in the shade of the Pole Plant log deck. Nature is fragile or is it? Humans certainly have the ability to wreak havoc on our environment, but given time, it heals. I’m not suggesting careless disregard. I believe it’s our responsibility to be the best stewards of our natural world that we can be. The ospreys don’t mess in their nest and neither should we. My experience as a forester over the years has taught me that Mother Nature is a relentless and tough lady. In the natural environment, disturbance often equals opportunity. In the top picture of Blitz lying next to the pole log deck, it is treeless except for the stacks of logs waiting their turn in the mill. Now look at the picture below. Blitz is sitting in a lovely pine forest. This place was a log deck too, forty-seven years ago. It wasn’t replanted by people. The surrounding forest took it back. The pines invaded this site with no help at all. I was six years old when this process took hold. Now a pine forest stands where a log deck once sat. This was the site of the Little Giant Mill log deck. Today, by replanting and with proper nurturing, we replenish harvest units and the burned areas much faster than just letting nature take its course. We have a better scientific understanding of our environment and more sophisticated technology available today to manage our forests. We’ve come a long way in forest management over the last one hundred years. Trees weren’t replanted back then, but forests have grown back. Our sustainable forestry practices today are resulting in forests that are more healthy and vigorous. I’d love to see these forests a hundred years from now. 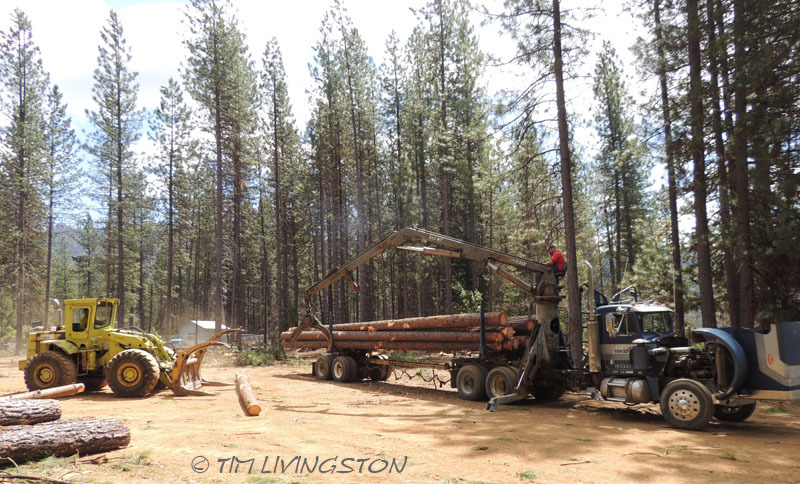 Forestry Friday … Movin’ Logs Old School! 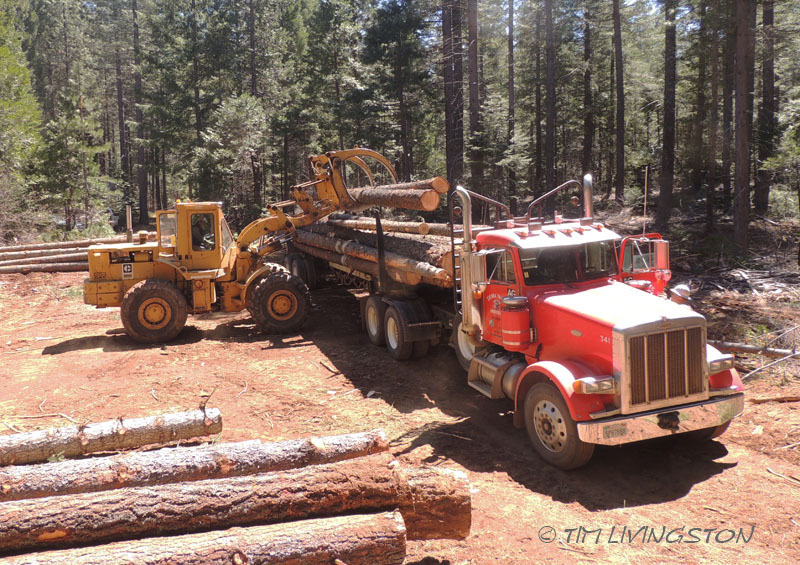 Every logging operation needs a log loader and there are all types of them. This pen and ink is of a Barnhart log loader from back in the railroad logging days. It was a big steam-powered loader for loading big logs. Here are some of today’s loaders. The heel-boom loader is today’s log loading staple. It is also referred to as a shovel by the loggers. The front-end loader was the standard for years, but is still common in the woods. 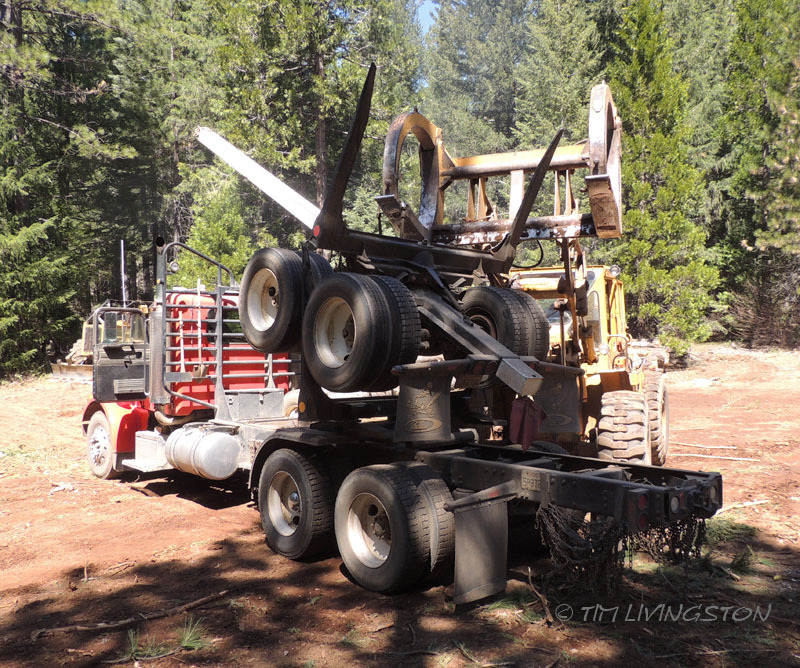 The logging truck hauls the trailer, also known as a log dolly, in a piggy-back configuration. 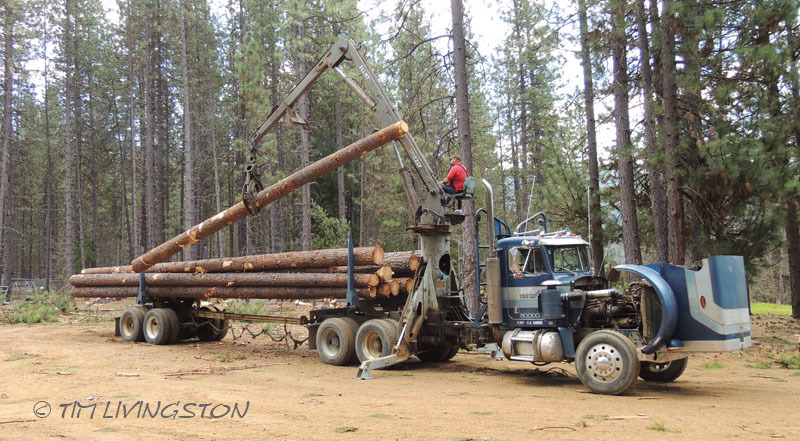 Here the front-end loader unloads the log dolly. 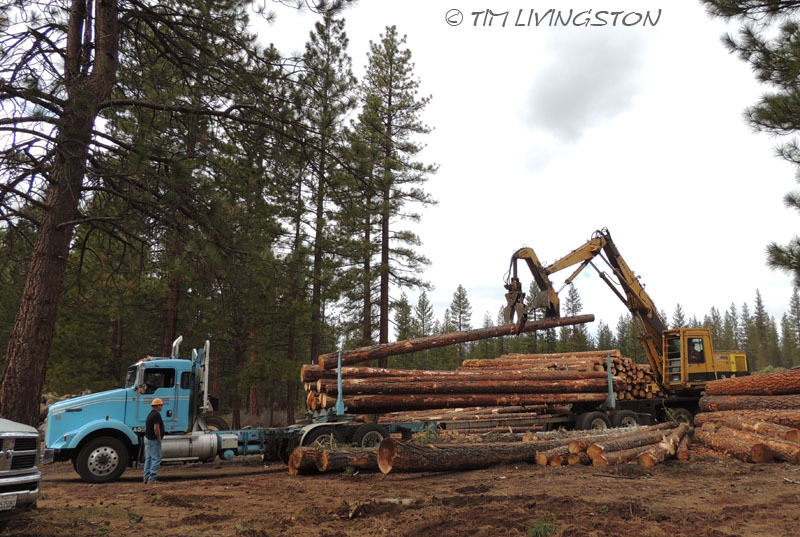 The self-loading logging truck has its own loader built-in. I thought it was odd that the operator lowered the hood when he loaded his truck. I assumed it may be running hot. However, when he finished loading the truck, he went over to the engine compartment and pulled out a stick, which caused the engine to throttle down. He had wedged the stick into the throttle to keep the engine revved up while he was running the loader. He then put the stick in the tool box and said, “I gotta put it up here or the dog will run off with it!” Good thing I left Blitz in the truck. In this picture, they used a front-end loader to assist the self-loader. Normally they use the self-loaders when another loader isn’t available. This old green beast of a front-end loader was barely running, which is why they were using the self-loader. These were two weary old machines. Blitz is seriously wanting the throttle stick right now. I’ve known Bob for a long time. Bob is a Logging Supervisor or Woods Boss. His operations are a going concern. Bob is all business and his guys make logs in a hurry. When I go out and talk to his crew about log quality Bob gets nervous because I’m slowing down his operation. He isn’t the kind of man that one would think of as going around showing off a piece of art, but that is what he has done for nearly twenty years. Bob’s landing, whackin’ and stackin’ . Bob’s dog is named “Would”, not Wood even though he is wood. 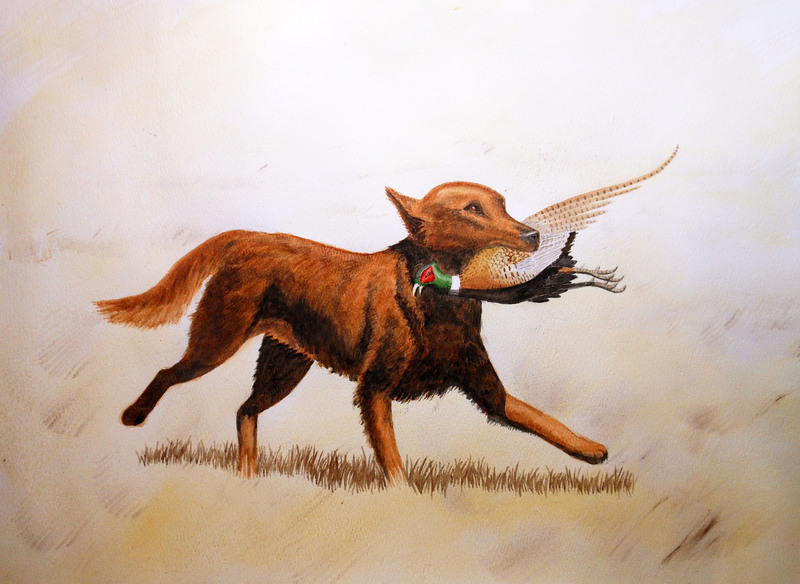 If you ask him why “Would”, he will say, “He would bark if he could and he would s–t if he could, therefore he is Would.” Bob recently got a new work truck and when he didn’t put Would in the truck he caught so much hell that he had to load him up again. 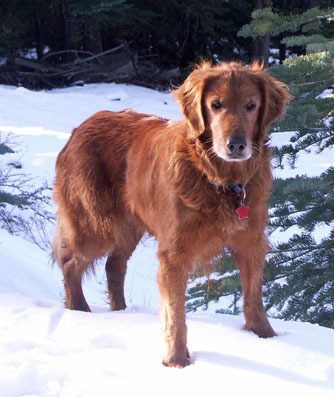 Would has been Bob’s constant woods companion for the last twenty years. He never whines, growls or barks. He doesn’t need food or water and doesn’t mind all the stuff in the back of Bob’s truck. I think Would has mellowed over the years, even developed a fine patina. 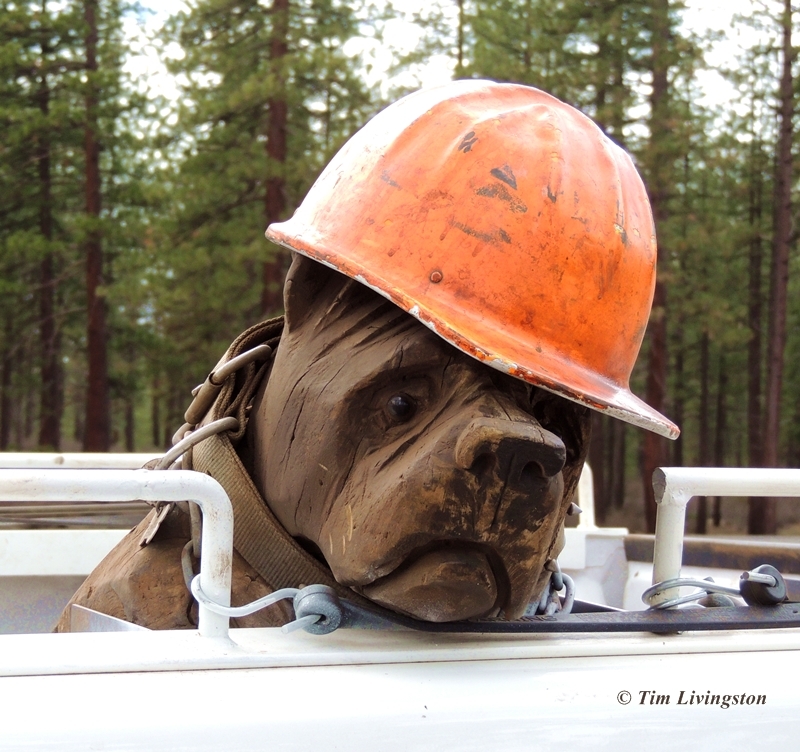 He may be the perfect logger’s dog. 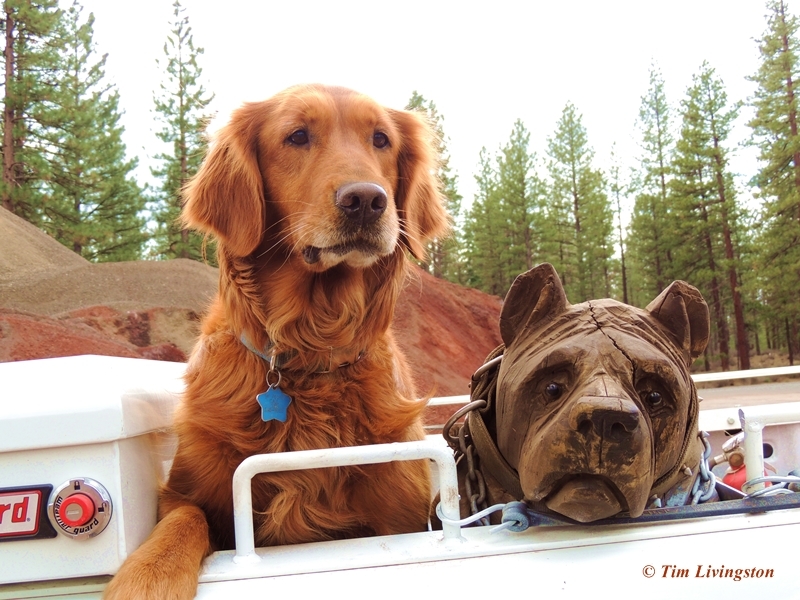 The forester’s dog and the logger’s dog. I had Blitz join Would for a group shot. The two of the got on famously. Blitz is, after all, the consummate stick dog. Fortunately, she didn’t chew on his ear. I tried to get Bob in the picture, but tough old loggers don’t always like having their pictures taken. I’ve decide the name the painting “The Misery Whip.” I’m not done yet, but closing in. It is almost midnight so I’m packing it in for tonight. Here it is so far. “The Misery Whip” a work in progress. I have an impending deadline. 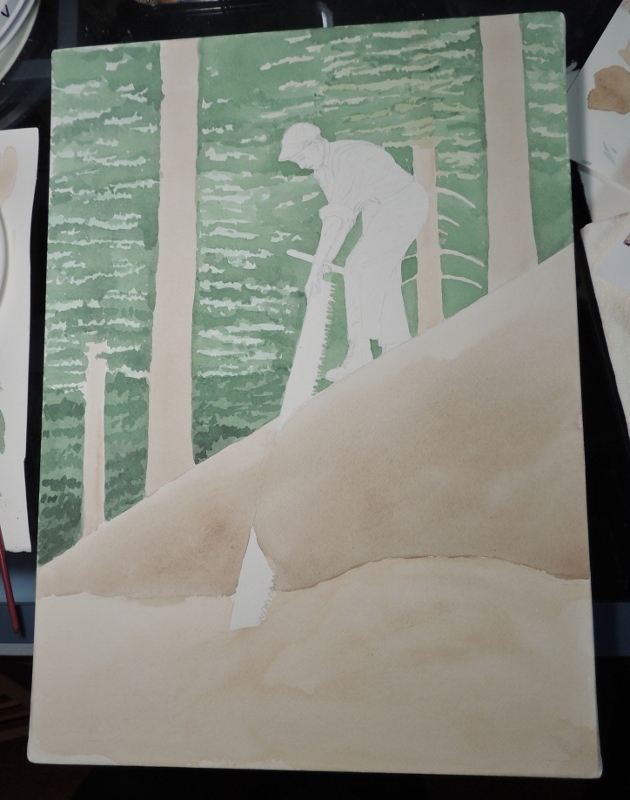 I am creating this watercolor painting as a donation to the Sierra Cascade Logging Conference, Education Day live auction. 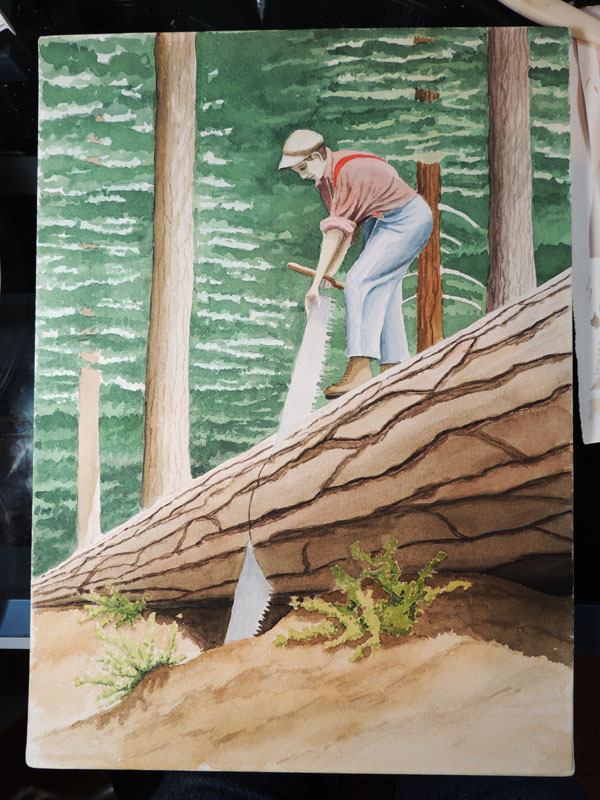 It is a 1930’s era logger bucking logs with a crosscut saw, also known as a “misery whip”. I sketched it the night before last. I stretched my paper yesterday morning. Last night I started putting paint to paper. Tonight I have to finish it. Tomorrow I will need to cut the mat and frame it so that tomorrow night it goes to auction. whewww! I’m ready for a nap, unfortunately that will have to wait until Sunday. This part is for any Conference attendees. I’m posting this to the Conference facebook page in case there are any attendees going to the Education Day Dinner and happen to look online. We want you to show up with your check books because it’s fundraising time. You can bid on this if you like it, or bid on something else if you don’t, but bid! It is a WIP. This is where I stopped last night, but now I’m back at it. Updates will be forthcoming. 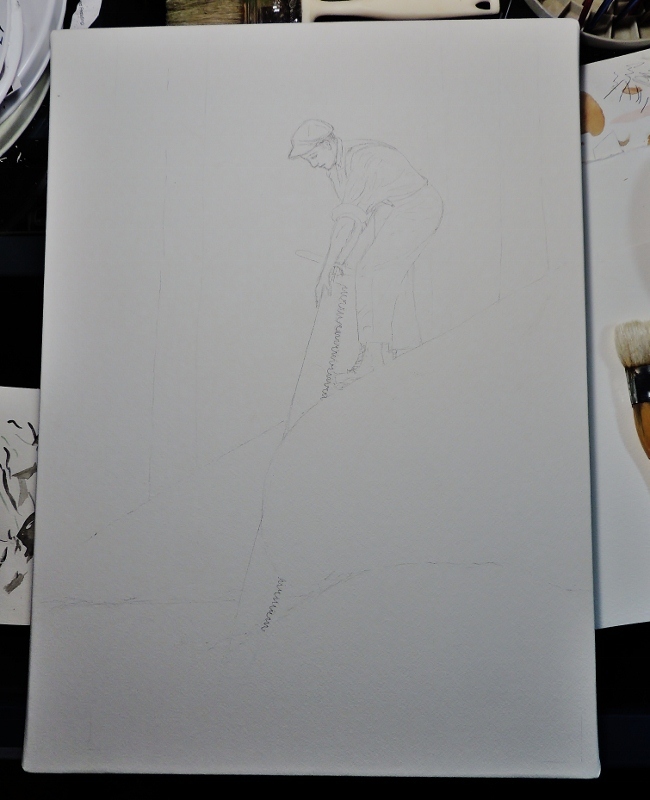 In the beginning, the line art. 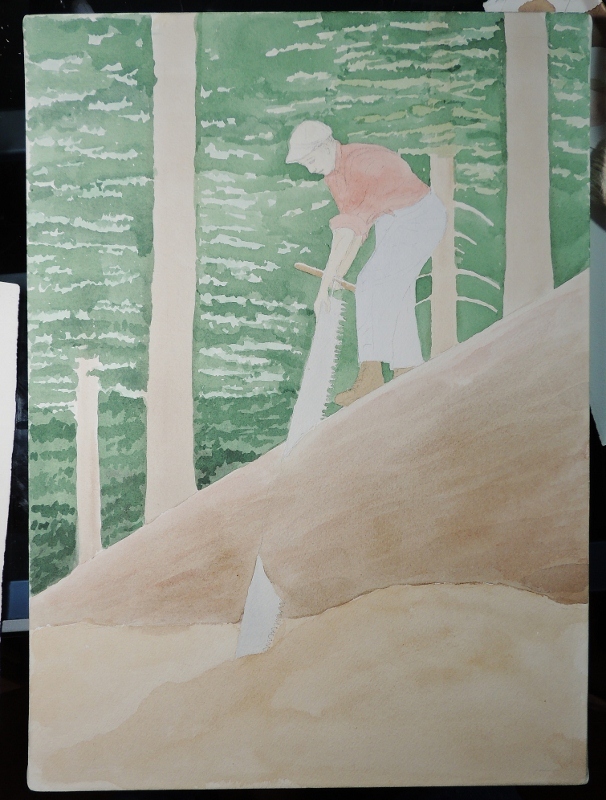 The background washes and starting to find some detail. Completed intial washes and adding some background detail. You may be asking, why did he wait so long to start this? An excellent question and one to which I have a good answer. However, I can’t go into that now, because I just don’t have time. That will be another blog. Stay tuned. Hey, You Aren’t Supposed Be Here! Who is the brightest of them all? It is a new year with new pictures to take, and new art to make. I’m back at work and it is a beautiful, cool and sunny day here in Northern California. I spend part of my time at an industrial mill complex. When folks think of an industrial site they rarely think of doing wildlife photography. Although, it seems counter-intuitive, this site is a magnet for wildlife. There is water all around the site and the wild areas here, get little disturbance. This morning I took a few pictures of some of our residents. I have taken so many pictures of wildlife here at the mill that I am going to start a new catagory called Wildlife At The Mill. I’m not sure they are speaking to each other. The Great Blue Heron, also known as “The Fly Up The Creek”. She is finally done. I hope you all like her. It only took 10 plus years to complete. Not that long to paint, but the procrastination and misplacing took years. Now for one more Nellie story. 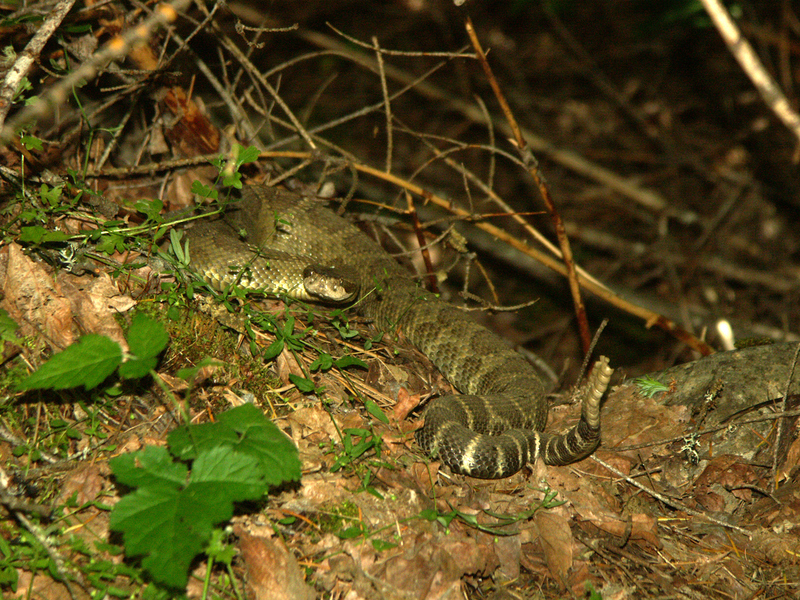 The Northern Pacific Rattlesnake as photographed that day. The yarder engine roared and the cable snapped tight. Limbs and debris went flying as the yarder heaved the logs into the air. From the bottom of the canyon the logs sailed up the hill until they were suspended over the landing. Then they dropped to the ground with an earth-shaking thud and a cloud of dust. I was visiting a logging job to go over log quality with the siderod. It was a hot, dry afternoon on the mountain. 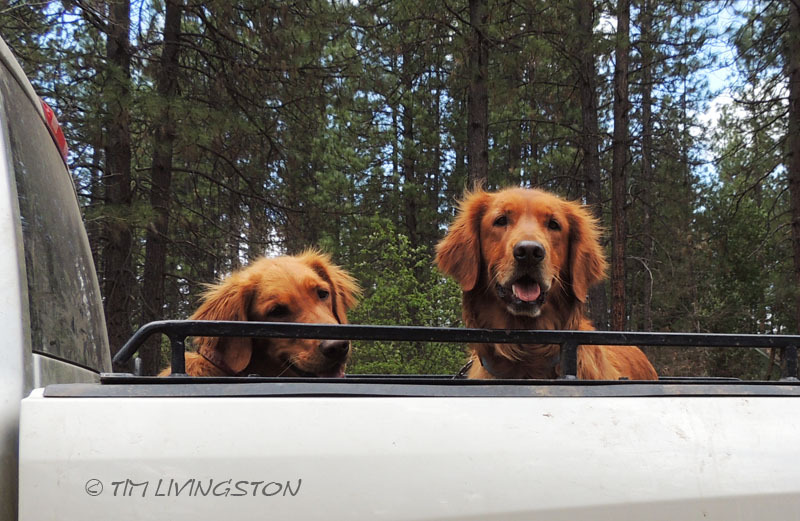 On this day, Hawk and Nellie, two panting golden retrievers were riding in the bed of my truck. They were my traveling companions. “Okay, guys time for a drink,” I said to the dogs as I climbed into the truck. We pulled out of the dusty landing and headed down the steep, winding road. After a few miles, we stopped at a flat next to Deadwood Creek. The Forty-Niners mined this little creek during the Gold Rush. Its banks were piled high with the old mining tailings. I popped open the tailgate and let the dogs out. Smelling the water, they both turned and headed down a trail to the creek. As I followed them, I could hear the wind rustling through the leaves. They got right into the water and drank their fill. This was followed by swimming and eating grass along the bank. When they had enough, I started back up the trail, but didn’t call the dogs. I was trying to beat them to the top of the stream bank so they wouldn’t run me over on the steepest part of the trail. When they realized I was leaving they raced after me. Instead of taking the trail, they took a different route. We all reached the top of the bank at the same time. They stopped about fifteen feet to my right and then I heard a rattlesnake. The sound was coming from where the dogs were standing. I frantically began calling them and ran toward the truck to draw them away. They followed within seconds, but it seemed like minutes. Once safely in the back of the truck I quickly examined them, but could find no bite marks. Unconvinced that everything was okay with the dogs; I grabbed my camera and headed back toward the rattler. When people are bitten by a rattlesnake it is important to know what specie of snake the venom is from. The anti-venin given to treat snakebite is specific to each type of snake. I didn’t know if that was true for dogs so I wanted to identify the snake just in case. When I was within forty feet of the snake it started buzzing loudly. I had a sinking feeling. This snake was really agitated. I got as close as I could and took pictures. It was a Northern Pacific Rattlesnake. I hurried back to the truck fearing the worst. When I reached the truck my fears were confirmed, Nellie was holding her left hind leg up and out. As quickly as I could, I chained Hawk in and scooped Nellie up in my arms. I loaded her into the front of the truck and sped down the road, leaving a cloud of dust. We were an hour and a half from town. Nellie couldn’t sit still as pain from the snakebite racked her body. She kept leaning against me until she couldn’t stand the pain anymore. She would change positions, move around, and then come back and lean against me again. All I could do was drive fast. I stroked her, but could give no comfort or relief. About thirty minutes after leaving the flat, I was able to get a cell signal. I called Mary, my wife, and told her what happened and that we were an hour out from the vet’s office. She said that she would alert the veterinarian and meet us there. Dr. Joy came almost immediately and began the examination. She took blood samples. “Some snakebites are dry bites that don’t actually deliver any venom. We already know by the swelling she has been envenomated, but the blood work will tell us how she is responding,” she said. After riding in the truck with Nellie I already knew the blood work would show that she was in bad shape. Once the blood work confirmed that her red blood cells were being destroyed, she was started on antivenin. There was nothing left for us to do but call our son. Nellie was his, but he was active duty Air Force so she stayed with us. Now we had to give him the bad news. He was very worried for her and we promised to keep him up to date. 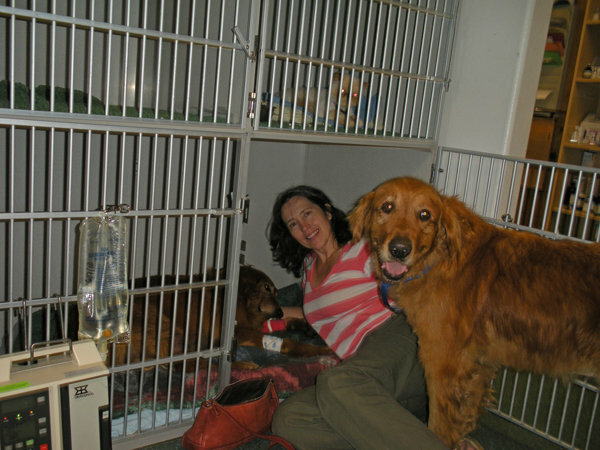 Later that evening, Dr. Joy called to tell us that they wanted to keep her for observation for a couple of days, but that Nellie had stabilized and was resting comfortably. This was good news. Mary and Tom dog visiting Nellie at the Vet’s office. She was one sick pup, but it sure perked her up seeing us. About mid-morning the next day, while I was at work Mary called me to tell me that Nellie was going downhill fast. 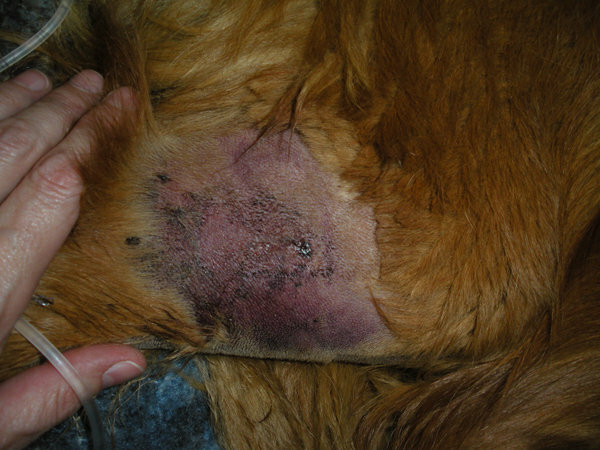 The vets shaved her leg to look for an additional bite wound, but they didn’t find two bites, they found six. All bites were on the same leg, but on all sides. The vets started round two of antivenin. Again, we waited for the medicine to do its work. By the next day she was doing better, and from that point on she steadily improved. She came home a week later. It took the fight out of her for a good long time. Eventually she made a full recovery. To this day, our veterinarians say this was the worst snakebite they have ever seen. Today at twelve she is still an eager traveling companion of mine. She never likes to be left behind. Nellie, always ready to go. When I reflect back on the events of that day, I remember the sound of the wind rustling through the leaves, but it wasn’t breezy that day. I realize that the sound I heard wasn’t the sound of leaves, but the sound of a nervous rattlesnake buzzing quietly. The rattler had been sunning himself and warned us to stay away. I didn’t recognize it at the time for what it was. I believe that when Nellie reached the top of the creek bank she stepped on and stood on the rattler. She is a very stoic dog and didn’t get off of it until I called her. Meanwhile, the rattlesnake repeatedly bit her, because it was responding to her apparent attack. The rocky tailing piles along the creeks are prime rattlesnake habitat. Scouting these sites before turning the dogs loose is now our standard procedure so that none of our dogs have to experience what Nellie went through. There is a snakebite vaccine made for dogs. However, it has limited effectiveness for most rattlesnake envenomation. It works best on Western Diamondback bites, but provides little or no protection from the Northern Pacific Rattlesnake. If you are considering the vaccine for your dog, talk to your veterinarian. Also, find out which poisonous snakes are most common in your area. Due to technical difficulties I wasn’t able to access all of the photos I planned to use, until now. The Nellie painting was completed some time ago. I apologize for the delay, and I hope you enjoy the post.